For a now show, all the reservation amount will be debited. 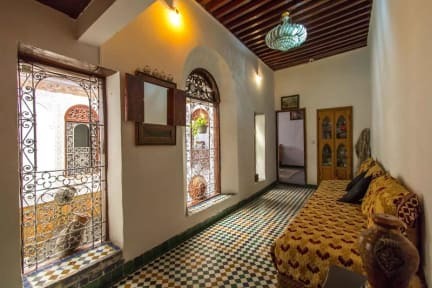 Dar Lalla Kenza is located in the old medina, just a few minutes’ walk from the most important monuments (the Karaouine Mosque and the Tanneries). We are two minutes away from Bab Rcif, the most centrally located among medina's gates and which allows the quickest access to central historical part. Our purpose is not only to provide you with a comfortable stay, but to give you the opportunity to discover the ancient local culture, its history and its people. The property itself was the owner’s home and maintains a down to earth, warm, and familial atmosphere. The owner is native to Fez and can help you arrange your travels around the Medina’s blue gate, tanneries, cooking classes and the public souk, among other places. Day trips that the staff can help with include trips to Meknes, Volubilis, the Middle Atlas Mountains and to the Sahara desert. The staff can also offer travelling options that accommodate the guests preferences ranging from private tours, to cheaper group tours every day of the week. We are connected with other travel businesses and can easily connect you with guides and transportation. Through your explorations, you will gain a unique perspective on the oldest and largest medina in the world, which has been declared a UNESCO World Heritage Site. If you are on the run from stress, Dar Lalla Kenza is the right place for you. We have a big patio, two terraces and spacious rooms that include private bathrooms, and hot showers. Our rooms range from single bedrooms, to double rooms, and a 7 bed dormitory. We can accommodate up to 20 people in our rooms and many people meet each other and plan their days together in our furnished communal sitting area. There people connect over tea, shisha and their experiences. 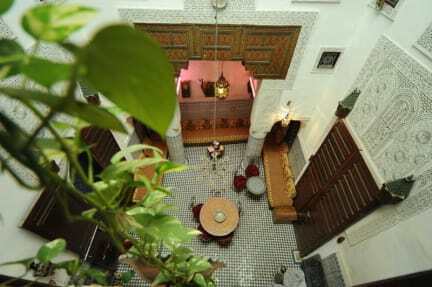 The property home is built and decorated in a traditional Moroccan fashion. Stained glass colors the sun rays that shine into the rooms. Columns, walls and floors are covered in patterned tiles, intricately painted wood and etched clay. Ivy creeps down into our common area from hanging pots, and the home comes alive with antique bowls, indigenous tools, vases, hand woven bed coverings, and traditionally forged clocks. We’d like to invite you to appreciate the beauty of Moroccan culture and architecture, and build a positive experience with our guests and staff. Guests are of all ages and bring interesting stories from around the world, and conversations can be mind opening. Other amenities include a Moroccan breakfast served with mint tea, We also have a computer connected to the internet and a printer at a very low cost for customer use. For safety purposes, we have security cameras in common areas, and we offer lockers for important items. In the evenings, guests are also welcome to watch films on our projector. Come to Fes. We await your arrival!